It took sheer brilliance on the part of someone from the organising team to decide to poke fun at the Olympic opening ceremony ring malfunction when the games came to a close. It proved something that I have known for the last eleven years: Russians have an incredibly good sense of humour, even if it is dark at times. Despite a blitz of negative publicity, the organisers at the 2014 Sochi Winter Olympics went on with the task at hand and did a remarkable job in organising the sporting spectacle. International Olympic Committee president Thomas Bach heaped praise on Russia for delivering as promised. “These were excellent Games that may lead to the reversal of some criticism of the Russian organisers that preceded the Olympics,” he said at the closing ceremony. But the real story of the games is the performance of the Russian athletes: 13 gold medals, 11 silvers and 9 bronzes. The success story goes back to early part of the last decade when Russia was clearly turning into a has-been in world sport. The instability of the 1990s had by then taken its toll on sport and the country looked like its best days in sport were behind it. Many sporting facilities were turned into shopping centres and commercial properties and young people stopped looking for a career in sport. One of the cornerstones of Vladimir Putin’s policy to revive Russia and make it a great country once again was to encourage sports and fitness as a lifestyle choice. There should be no doubt that the president led by example. His healthy lifestyle and passion for sports was an inspiration for many people in the country. The real turning point was when Russia was awarded the 2014 Sochi Games. Every region in the country went into high gear to scout for sporting talent. The strategy for the games was something that even the Chinese, who are known to be brilliant planners, would have been proud of. Funds were lavishly allocated to train the best talent, nationalistic sentiment was swept aside to bring in the best coaches and trainers and there was a clear adoption of new approaches to sports training. The performance at Sochi was clearly the culmination of years of hard work, planning and flawless execution. Each of the 33 medal winners has a story to tell, but few stand out like Viktor Ahn’s. Born Ahn Hyun-so, the naturalised Russian speed skater had a great legacy as the winner of 3 gold medals and a bronze for South Korea in Turin in 2006. After his injury in 2008, the effects of which denied him a chance to represent his country, Ahn was written off in his native country. Russia accepted the champion as one of its own, helped him with training and virtually re-launched his skating career. He rewarded Russia’s faith by winning three gold medals and a bronze. It’s hard not to get goose bumps when measuring the crowd noise after Ahn’s wins at Sochi. Here was an ethnic Korean man who just recently became a Russian citizen and the sports faithful were even more jubilated with his performance than with many others. As someone who has seen how Russia embraces foreigners who take a few steps towards integration, the love of the Russian crowd did not surprise me the least bit. Then there’s Adelina Sotnikova, who put in an absolutely flawless performance and became the first Russian to win Olympic gold medal in ladies' singles figure skating. 15-year old Yulia Lipnitskaya dazzled in the team event with skating legend Evgeni Plushenko to win the figure skating team gold. While Plushenko rides off into the sunset as one of Russia’s great champions (by winning his second gold after 8 years), the young Lipnitskaya, “the little genius” as the legend called her, has a bright future ahead. The Russian athletes also deserve credit for performing so well under pressure at home. With a lot of the attention during the games on non-sporting matters, they would have been even more stressed to put up a good show. At the end of the day, they let their performance do the talking. Years from now when people talk about the Sochi Games, the discussions won’t revolve around the stupid toilet picture or the poor wifi that some Western journalists initially encountered. The talk will be about how the Russian team full of underdogs managed to shine in front of their home crowd. The success of the Russian athletes at Sochi is sure to inspire a new generation of winter athletes in the country who have contemporary role models to look up to. These games also mark Russia’s return as a global sporting power. In this day and age, when young people prefer spending time indoors with gadgets than they do with sport, this trend will see at least a small reversal. 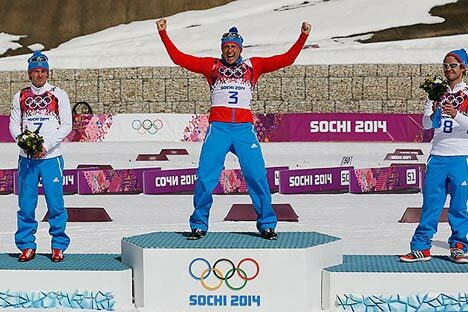 With the Sochi Games a complete success, Russia has every reason to be happy and proud.